It’s a common problem in 240’s, no dash lights. If you have had an after market stereo installed in your car and the factory nissan wire harness was cut off to wire the new unit there is a big chance that your TCU is burned out. The TCU is a timing control unit. 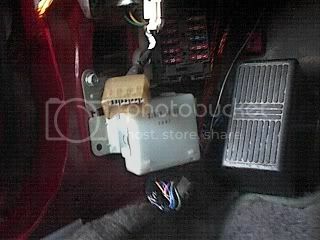 It is a small white box that is located to the left of your fuses that are under the driver side dash. You can either replace it by pulling one from a car at a junkyard or pay a lot of money for one at a dealers. The other choice is opening the little box up and soldering a jumper wire over a trace which is burned out with a soldering iron that you can buy at radioshack for 5 bucks. Soldering it will only take a minute if you have the skills. If you take it off and unscrew it, you will see a Printed Circuit Board with a lot of mounted components. The side with fewer mounted components that looks like it has green paths running around will most likely have one of those traces burned out. You can tell if its is black. I didn’t replace my unit and just fixed it buy soldering in a wire where the burned out trace was. But if you find that yours is burned out you can just replace it, and that will fix the problem too. The problem is the circuit that lights the dashboard lights, as well as the climate control knobs, and glove compartment is powered by a red wire with yellow stripe (-) and red wire with blue stripe (+). These wires also go to the wire harness for the stereo and are usually not used. If they are touched together during the stereo installation the TCU gets fried. Usually the fuse in the dimmer switch should go first, but after opening the TCU, I have found that the PCB (printed circuit board) is made by hand. I have some experience in PCB design and notice a lot of design errors. The traces that run on the board are to thin in some areas, so the TCU is the first to go. I have seen people fix the problem by grounding the red wire with yellow stripe. This will fix the problem, however the dimmer switch will not work after you have done that.